mīn(d)fəl/adjective​: conscious or aware of something. -inˈteɡrədē/noun: the quality of being honest and having strong moral principles; the state of being whole and undivided. All my life I have had an immense love and respect for horses, one that goes beyond the typical realm of equestrianism. It is this respect that has lead me on a journey to seek the best care possible for our domesticated equine partners. Every horse to me is invaluable, and all are deserving of the best life we can give them. 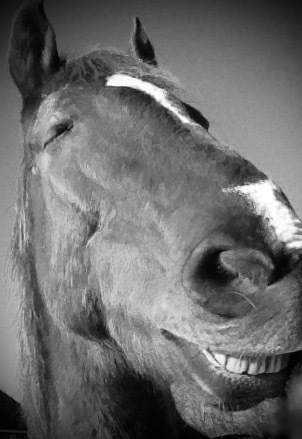 My horse The Lieutenant, better known as LT, is an American Saddlebred rescue, former Amish road warrior (buggy horse). Having being shod his whole life and pounding the roads working, he came to me with terribly unhealthy feet. When LT came into my life he was approximately in his late teens, and at that time I wasn't yet in the hoof care profession, however I knew his shoes had to come off in order to give him comfort and many more quality years. But where do we start? With all the 'natural' hoof care options available and with no one in my circle of horse people with shoeless horses, it was up to me to find the right hoof care practitioner. I was fortunate to find Chris Huppe, DAEP, and first read about Applied Equine Podiatry and the HPT (High Performance Trim) Method on Chris' website and I knew this was what LT needed! The theory behind the HPT Method and the philosophy of Applied Equine Podiatry just made sense to me. Despite the many people telling me my horse would not "survive" without shoes, I went with my gut and his shoes came off and we never looked back... LT lives a very happy life on 24/7 turnout with free choice forage. His feet are strong and healthy, and capable of handling any terrain. We have ridden on rocky hills and asphalt roads without missing a step. His success at transitioning was due to Chris' knowledge of the horses foot and returning proper function, along with my commitment to giving him the time and providing him with the environment he needed to heal. I am now a graduate from The Institute of Applied Equine Podiatry, where I received my DAEP (Diploma in Applied Equine Podiatry) and will be continuing my education with the Institute, along with attending various clinics and seminars pertaining to whole horse care. I believe in preventative care and focusing on the long term, versus looking for a quick solution or "band-aid." All humans and animals, have the innate ability to heal themselves, provided the environment is conducive to healing. The alternative ways of healing often require more time, however when we allow for this time we better our chances for long term success. The health of our horses feet is so important, as the saying goes "no foot, no horse," could not be more true. I am proud to provide a service that helps our horses have the healthiest feet possible. I live in CT and am currently accepting clients in CT, MA, RI & NY. For appointments and questions please go to my CONTACT ME page and fill out the form. I would love the opportunity to work with you and your horse(s), I look forward to hearing from you. *All content provided on this website is for informational purposes only, and is not intended to substitute veterinary advice. This website is copy right of Mindful Equus, Integrity in Hoof Care, and Emily Judd, DAEP. All Rights Reserved 2016 © ​ Permission granted for use of information from The Institute of Applied Equine Podiatry founder KC LaPierre, RJF, MEP, MIAEP.